JEWELL — No. 12-ranked (Class 4A) Gilbert plays defense like a python. It squeezes and squeezes until there’s no fight left in the opponent. The Tigers coiled around South Hamilton moments after the opening tip-off Saturday night, and they didn’t release their grip until the game was well in hand. Pressuring the ball from baseline to baseline, Gilbert (14-5, 10-2 HOIC) forced South Hamilton (7-12, 5-8 HOIC) into 23 turnovers. Eight of those came in the first quarter when the Tigers turned into a track team and sprinted out to a 17-3 lead behind a 13-0 run over the final six-plus minutes. 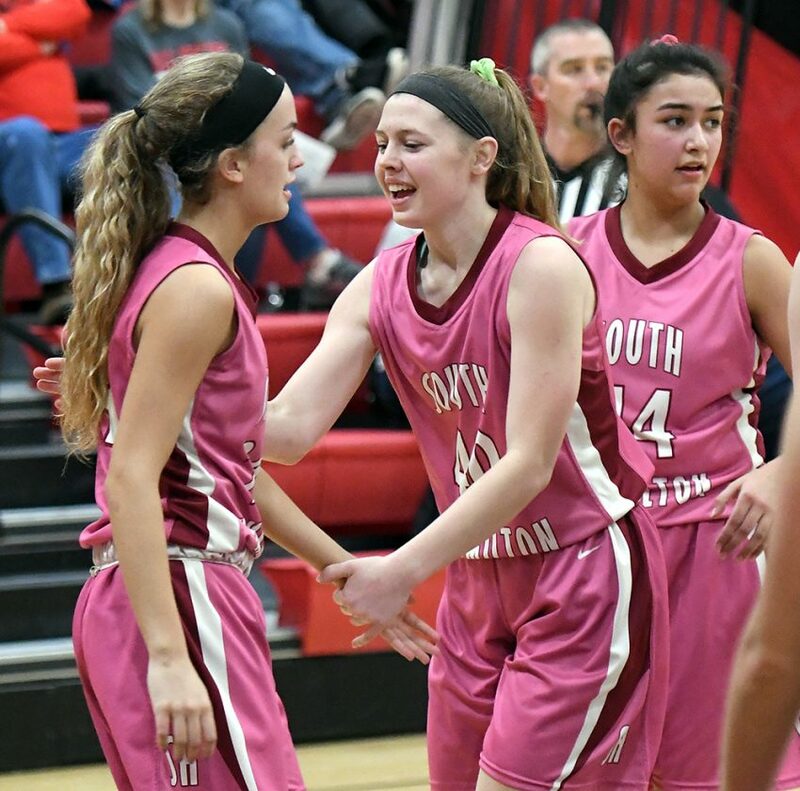 South Hamilton’s lone field goal in the first period was a Breanne Diersen 3-pointer from the top of the key. Baskets were difficult to come by for the Hawks, who registered just seven field goals in the contest. Gilbert’s aggressive tendencies led to 20 fouls and 23 South Hamilton free throws. The Hawks, which saw their four-game winning streak come to an end, notched 16 of their points at the charity stripe. Even with the early sizable deficit, South Hamilton was able to slowly climb back to within shouting distance. The Hawks trimmed their deficit to 12, 35-23, midway through the third period, but Gilbert answered with an 11-0 spurt to close out the frame and silence South Hamilton for good. 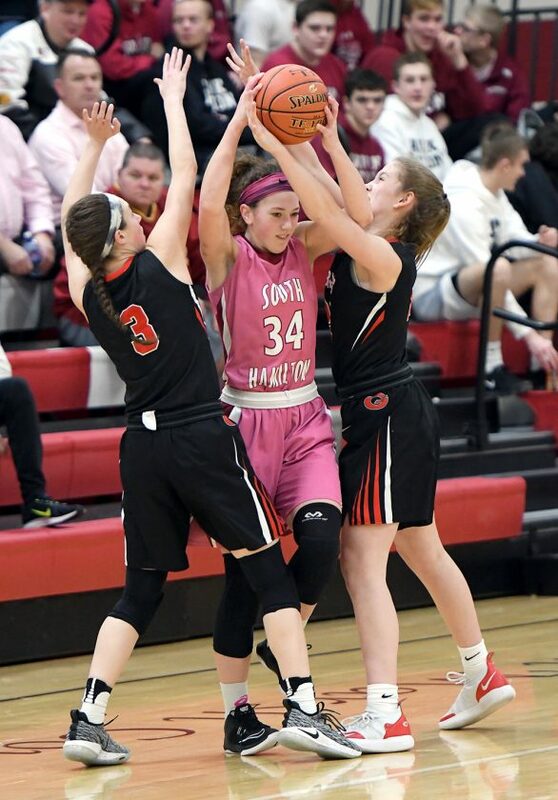 Emma Lewis and Rylee Woodall led South Hamilton with eight and six points, respectively. The starting guards combined to sink 10 of 12 free throws. Sydney Friest added four points. Nessa Johnson poured in 10 first-half points to help push Gilbert to a 31-15 lead and she finished with a game-high 16. Gilbert (14-5, 10-2 HOIC) — Ava Hawthorne 3 0-0 6, Skylar Hillman 0 0-0 0, Hannah Thatcher 2 0-1 5, Nessa Johnson 7 1-4 16, Ellie Bulman 1 0-0 2, Emma Kruse 2 0-0 5, Emma Bulman 1 4-6 6, Katie Currans 3 2-4 8, Grace Ellingson 0 0-0 0, Thea Rotto 5 0-2 10, Claire Roske 1 0-0 2, Jordyn Milhous 0 0-0 0. Totals: 25 7-16 60. 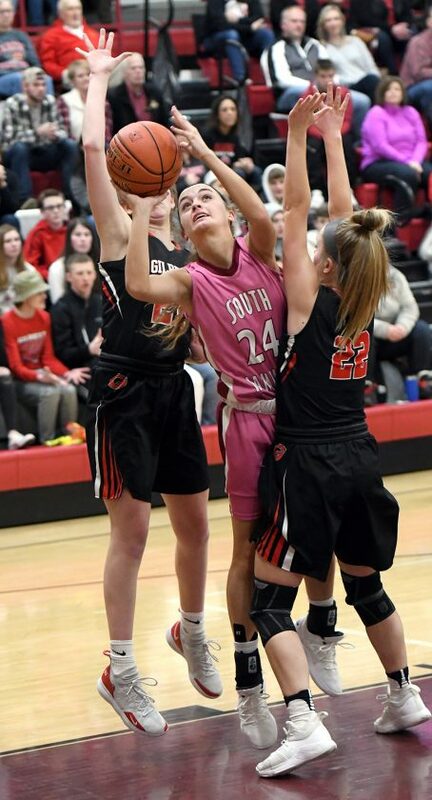 South Hamilton (7-12, 5-8 HOIC) — Abby Ervin 0 0-0 0, Rylee Woodall 1 4-5 6, Brookelyn George 0 2-4 2, Breanne Diersen 1 0-0 3, Brenna Barquist 0 1-2 1, Emma Lewis 1 6-7 8, Hailey Diersen 0 0-0 0, Kaylee Oskvig 0 1-2 1, Sydney Friest 2 0-1 4, Caleigh Hewitt 1 2-2 4, Aneesa Balderas 1 0-0 2, Kylee Gunderson 0 0-0 0, Krista Swenson 0 0-0 0. Totals: 7 16-23 31. 3-point field goals — GIL 3 (Thatcher, Johnson, Kruse); SH 1 (B. Diersen). Team fouls — GIL 20, SH 11. Fouled out — none.